Shitenno (Four Heavenly Kings) "Komokuten "
This is his first solo show in two years at the gallery and his outstanding performance during these years are found in various field such as CD jacket for a Japanese popular singer, a poster for Nezu Shrine Festival, illustration goes along with serialized novel on newspaper. 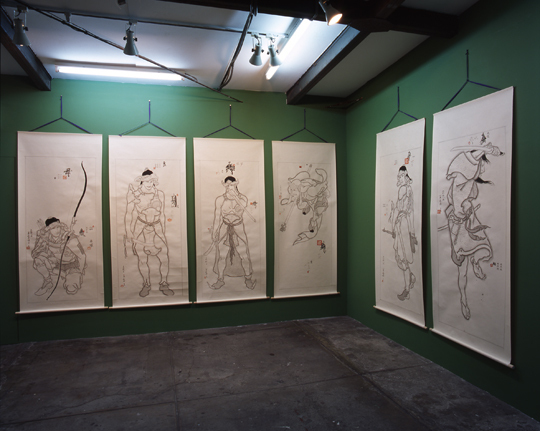 For this exhibition, he attempts to translate the secret idea, which has been in his mind for 5 or 6 years, into reality within two spaces of Mizuma Art Gallery. The main part of this exhibition consists of artworks shown at Art Gallery C Square in Chukyo University in this October. Yamaguchi’s representative works have been known for its mixture of the past and the present, and its detailed bird’s eye view of the city and battle scene that are all elaborately filled with his unique motives. Those who expect his usual tactics would be astonished with his new piece for “Lagrange Point”. He has been aware of audiences’ attention onto the picture surface and attempted to capture their eyes with his unique mixture of humor and cynicism. For this time, he diversifies it from “view” to “experience” the art piece. 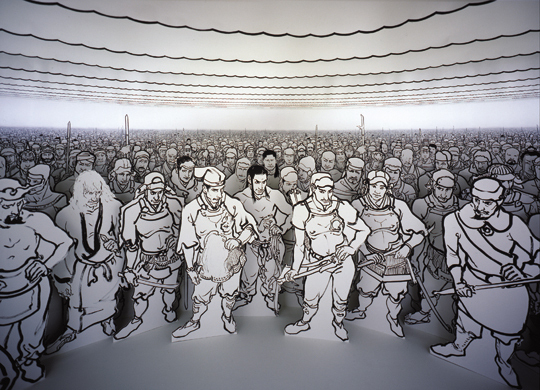 In the gallery spaces, you will find yourself experiencing Simabandha formed by four heavenly kings, and thousands of soldiers who await your command. It’s already been ten years since his debut as an artist and now is the time to enjoy the new experience produced by Akira Yamaguchi.